On my way to pick the last of the Lychees (after the Rainbow Lorikeets have just about stripped all the trees!) 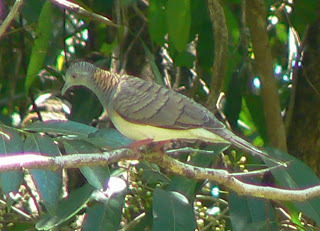 three Bar-shouldered Doves flew up into a tree, so I just managed to snap this one. Mostly we see them foraging on the ground.